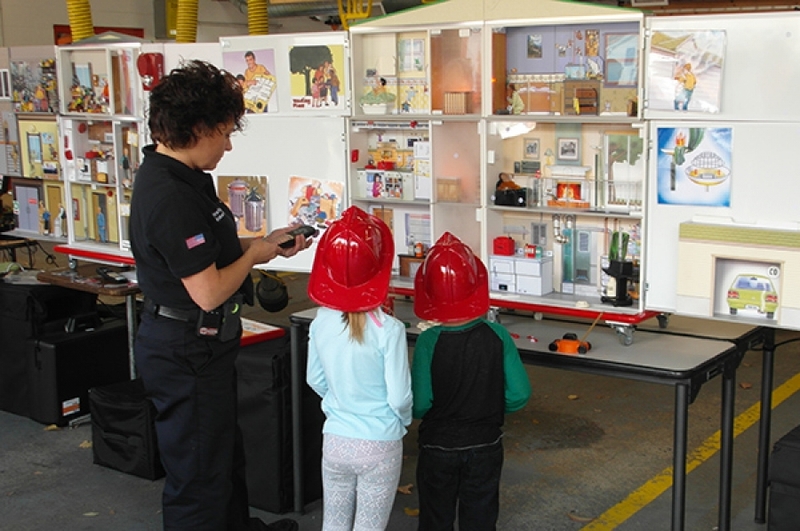 Danielle Robertson, from the Charlton Fire Department, MA, explains how the Hazard House and Hazard Kitchen fire safety props have become staples of their bi-annual Open House event. The Charlton Fire Department provides educational programs to all groups within the community, including targeted programs for school children like Fire Safety Week and Operation Safe Prom, along with presentations at The Charlton Senior Center and other senior homes. Danielle Robertson activating scenes on the Hazard House – Large Group fire safety props using the wireless remote. Danielle Robertson demonstrating the “flaming pot” simulation on the Hazard Kitchen fire safety props, next to the Hazard Apartment model.